A necessity in these rainy afternoons or early winter when all we want is to stay in bed in pajamas with a delicious soup. But our history with this recipe is very different. We love it for the cold wheather but is delicious and comforting when we are sick, is an excellent choice it fills us with energy and as my granny said there is no better medicine than this soup. Put to cook the chicken in water with onion, red pepper, bay leaves, garlic powder, cilantro and potatoes about 45 minutes over medium heat. Add the eggs with the shell and let it cook for 5 minutes, during this time can also add the pasta. Remove from heat and add the chicken. Before serving, keep in mind to remove the egg shell. Serve with toast and if you want you can add tabasco. 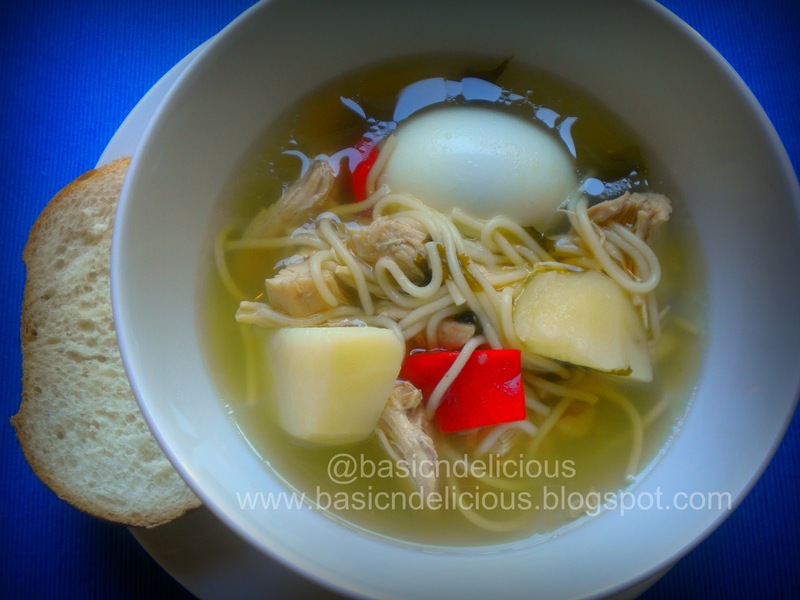 This entry was posted in Uncategorized and tagged chicken, potato, soup by Kathia Rodriguez. Bookmark the permalink.